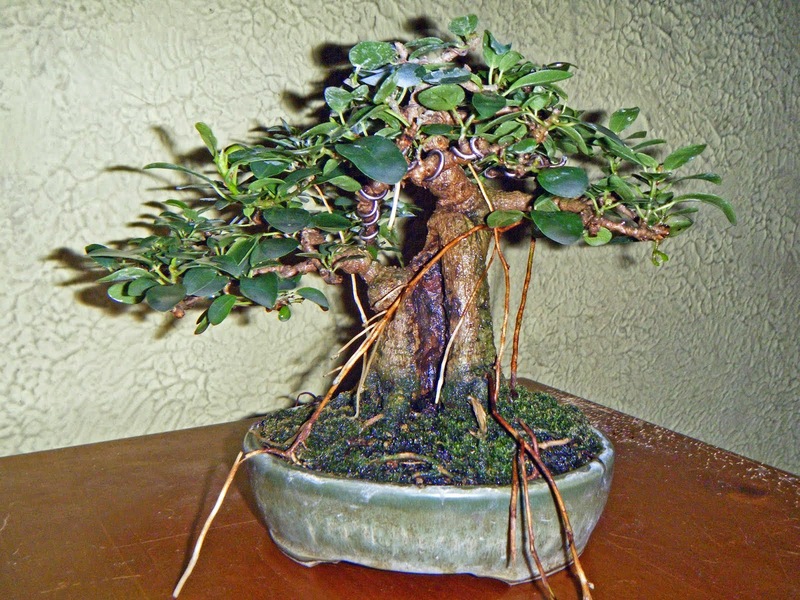 Bonsai in Hoosierland: MABA 2015 Convention - a fine job! MABA 2015 Convention - a fine job! I'm writing this post about three months after the event, but late post or not, MABA 2015 was a convention well worth writing about! From choice of headliner to the display to the workshops, critiques, and demos, the Indianapolis Bonsai Club, in partnership with MABA and assisted at times by other bonsai enthusiasts in central Indiana, did an outstanding job. William Valavanis of the International Bonsai Arboretum, renowned bonsai teacher and artist and well-known for his expertise in bonsai display, was outspoken in his praise. Special kudos are due to Paul Weishaar, Mark Fields, and Scott Yelich, who together led the effort. The headliner was Suthin Sukosolvisit, originally from Thailand, a bonsai artist and teacher with many awards to his credit. Suthin has a ready sense of humor and makes it a point to get his audience involved during a demonstration. And he's not afraid to think outside the box, as his design for his first demo tree demonstrates. Please forgive the quality of the first two pictures; I'm afraid I have no better ones from this point in the demo. twin trunks, I completely failed to guess what he would do with it. I wasn't alone. After getting a number of suggestions from the audience for a design, Suthin showed us what he had in mind. Suthin was clearly pleased with how the tree turned out. And what a transformation! The display was actually somewhat crowded, but that was because the convention planners expected about 135 trees and got about 175! I can think of worse problems. This magnificent yew, Taxus x media, met you when you first stepped into the display. Purchased a few years ago from the Kennett Collection by Paul Weishaar. Of course you can have fun with bonsai! Composition by Paul Weishaar. MABA, true to its mission, gave an award for the best bonsai created from an indigenous species. This native elm took that award. The label said it was a winged elm, but it must be a wingless variant. It's still an excellent bonsai. I kept coming back to this composition - it's just so well put together! The main tree, a Portulacaria afra, and the accent are both visibly desert plants, with different but harmonizing forms; and the stand for both is a stone slab with a complementary color. This bougainvillea won Best-of-Show at the 2010 Mid-America show in Chicago. Nevertheless Ryan Neil, judge at the show, pointed out that in Japan it wouldn't considered show-ready, because the ramification was not yet very developed. The owner has obviously taken Ryan's remarks to heart since then. I look forward to seeing it again from time to time in coming years. Jack Wikle remains the master of mame display! He also continues to successfully grow trees under lights year-round. Jack is also a consummate bonsai artist, as this mame cypress shows. Another angle on the same tree. Notice the carefully-developed structure. Jack gave me permission to pick the tree up for this picture. This veldt fig (Ficus burtt-davyi) reminds me of some of the trees I knew in the Ecuadorian rainforest. Owner and artists is Scott Yelich. this composition. I felt like I'd been carried to a rocky New England hillside. William Valavanis has been developing this larch forest since sometime before 1983.
but this could be an outstanding bonsai composition in the future. Jim Doyle, in his Critique, couldn't say enough good things about this choice of pot color and finish for a trident maple. another native of the MABA region. Common names are "American arborvita" and "northern white cedar." Paul Weishaar's willow-leaf fig (Ficus salicaria) on a stand Paul carved from a block of walnut. He used a chain saw for the first rough work! Another of Jack Wikle's mame displays. The cartoon is from a past issue of BCI magazine. I usually buy a few raffle tickets at a convention or show like this; even tho the odds of winning are low, the money helps support the event. This time, tho, I won something I really wanted: this shohin-sized yew. I suspect my grin didn't fade until the next day! Taxus x media 'Densiformis'; around 25 years old (plus or minus 5 years,) from a cutting. This tree was one of a group of yews that Mark Fields purchased from Mark Comstock in Connecticut, for his yew workshop. Mark (Fields) bought a few extra trees, to be sure to have plenty for the workshop; after it was over he donated one of the unused trees to the raffle. I'm going to have fun working on this beauty!